In a weblog post yesterday, I suggested we might need a category called "green martyrdom." The background to this, of course, is what is traditionally regarded as "red martyrdom" -- dying a violent death for one's faith -- and "white martyrdom" -- consecrating one's life (with vows of celibacy, poverty, and obedience) exclusively to Christ and the Church. Today is the feast of St. Cecilia, who had consecrated her life to the celibate service of Christ and who was martyred for her refusal of a forced marriage. She was hardly the only martyr to have been both a "white" and a "red" martyr, but the nature of her martyrdom certainly links these two together most powerfully. 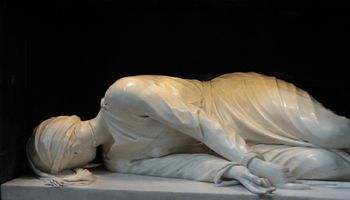 When Liz and I were in Rome in 2005, preoccupied as we were with the huge scar on Liz's head from the brain surgery she had recently undergone, we were both struck by the stunning sculpture of the martyred Cecilia by Stefano Maderno, showing her body as it was when her tomb was found and opened, the mortal wound to her neck prominent. A small replica of this life-size marble sits on a bookcase in our living room, a reminder of many important things about the Christian vocation.